I just wanted to share this quick and easy craft we just did to get ready for the Olympics tonight. We made torches! We will be doing other activities over the next two weeks while we watch the games but this one was so easy I wanted to share it right away. You could even do it while watching the opening ceremonies tonight. The girls colored cardstock. We then cut it into strips which I rolled up and hot glued together to make the handle of the torch. 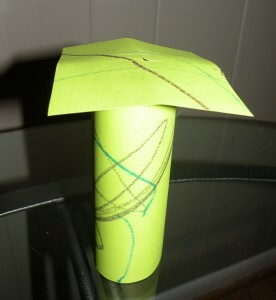 We are currently on vacation (which is why I haven’t been blogging) so we didn’t have many supplies to decorate them with but you could keep it simple with crayons or you could use paint, pastels, or foamies. Then I just cut a square out of the decorated cardstock for the top piece. Before gluing it to the top, I cut a little cross out in the center. 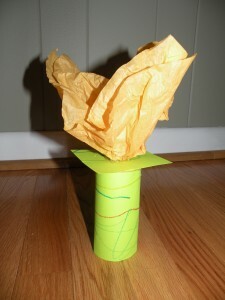 Then we cute a piece of yellow tissue paper in a square and folded it up to make the flame. I stuck the end down into the hole in the center and hot glued it all to stay in place. 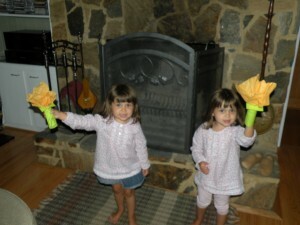 The girls have been marching around and are very excited to hold their torches during the opening ceremonies.